With the right home office furniture, you can take your workspace from dull and boring to inspiring and energetic. Our décor experts offer simple tips to help you achieve a quick and easy makeover that transforms your home office into a dream work environment. Choose the right location: Whether it is the den, the attic, basement or a space in your bedroom, living or family room; make sure it is an environment you will be able to work in. Determine your equipment and storage requirements: Think about a computer and printer, telephone, storage cabinets, bookcases, etc. Storage space will play an important role in the type, size and amount of furniture you can have. Select stylish home office furniture: Tasteful furniture will set the character and mood for any type of home office. Your desk and chair are the most important elements of the room as they occupy most of the space. Take the time to select items you will love to use. Don’t just focus on function but form and comfort as well. Pay attention to the lighting: Good lighting is essential for preventing a strain on your eyes. It also helps you highlight important design elements in your home office. You can use a combination of task, spot and ambient lighting; even add a vintage lamp for style. Accessorize: Personalize your home office with items and accessories you like. Photographs, a plush rug, your favourite colour on the walls, a bar cart… make it all about you! Traditional, contemporary, ethnic, no matter what your style…unique desks and chairs can truly transform any room (or space) into a chic office that oozes style and character. Assert your knowledge and style with a Sophisticated In-Laid Mahogany Executive Desk and Italian-made, carved Louis XV Styled Leather Wing Chair. Infuse character with a Vintage Mahogany Beacon Hill Original Breakfront China Cabinet. Add elegance with a Traditional French style bar cart from the Mid-20th Century. 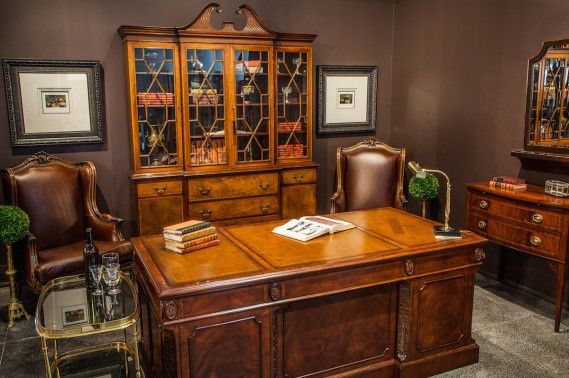 Make a stunning design statement with a Vintage Scene Two Series Burled Ash Executive Desk. Show off your unique taste with Vintage Original Condition Italian Rosewood China Cabinet and Original Walnut Chest. Impress business associates with a Pair of Mid-Century Chrome and Faux Ostrich Lounge Chairs. Add flair with a Macassar Ebony Drink Table. Relax at the end of the day in your luxurious Mid-Century Modern Arm Chair. Hold everyone’s attention with a Custom-Made Black Lacquered Office Desk paired with an Antique Italian Leather Arm Chair. Charm one and all with a newly-restored French Brass Bar Cart with the light, seamless visual quality characteristic of the Mid-Century style. 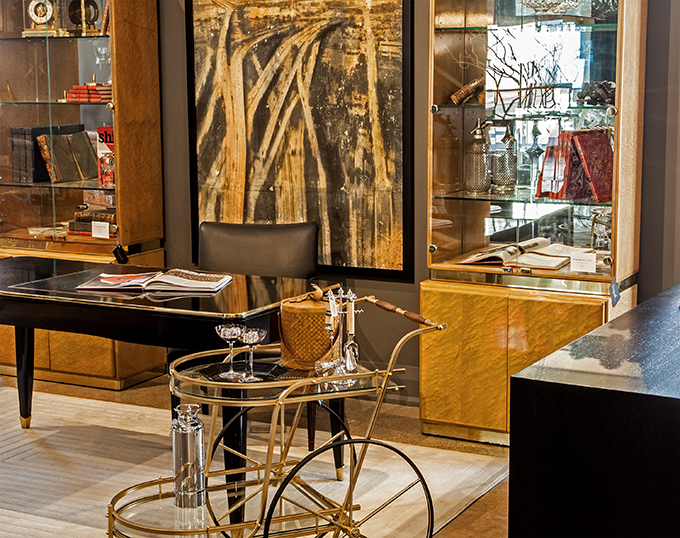 Go for a gold finish with Milo Baughman Armoire Display Cabinets. Experience the difference fine home office furniture can make. Visit the luxurious Carrocel showroom in Toronto. Our experienced staff will be happy to show you around, discuss your decorating ideas and help you make a selection. 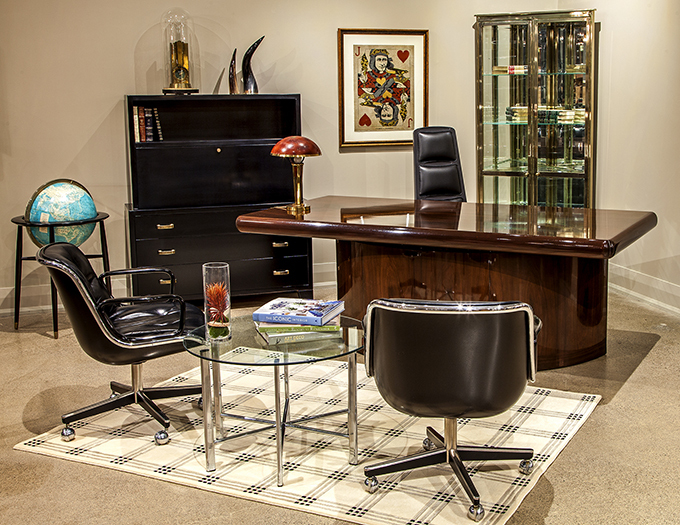 To transform your home office with our luxurious desks and office furniture, please visit our furniture showroom. Call us at 416-999-2525 for more information.